"Orbis Veteribus Notus" (English: ~The World Known to the Ancients) was originally produced in 1794 by the French geographer and cartographer Jean Baptiste Bourguignon d'Anville. It covers all of Europe, and parts of Africa and Asia as it was known to the people of the Ancient World around the year 1CE, with all the place names in the dominant language of the time, Latin. It is considered to be one of the best maps of its kind, and used the works of Ptolemy, Herodotus, Thucydides, and others in its creation. Review by Nathan on 8/27/2015. S-P-E-C-T-A-C-U-L-A-R!!! This may well be the best map I've ever had the pleasure to review. 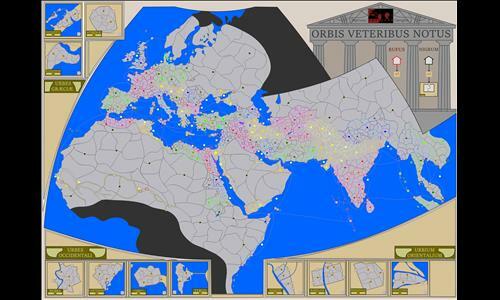 World-spanning in scope, it combines the best features of the large Roman maps with city cut-outs, seaport linkages and bonuses for major cities. Its system of trade routes in the Sahel is the most unique solution to getting bogged down in Africa I have encountered. It also boldly (but intelligently) uses bonus imbalance to reflect the comparative values of populated regions and wilderness. My only complaints - more nitpicks, really - are (1) that I would like to see a territory linking the north and eastern shores of the Caspian Sea, and (2) I would like an African port between Berenice and Acane. - In the Nineve cut-out, the two northern Porta Nineves should not connect to each other. - There may have been one more broken connection, but I can no longer find it. Review by Zephyrum on 8/1/2017. AMAZING! Such detail, and very similar to the original map. I just HAD to write a review. Looking at this map makes me want to spend three days straight building all kinds of scenarios! Lots of potential, the towns are incredible and even allow us to eventually play with Local Deployment! The inner city maps make big cities as valuable as they should, and they're just perfectly sized to add to their value without taking too long to capture. Congratulations to the maker! Review by General Scott on 8/30/2015. Review by Donaldrenio on 10/12/2015. A big map, but with 5 teams of 3 it quickly filled and became a really good fight. A real mix of bonus areas makes you think about your expansion well before you have the troops to expand everywhere. A great map well worth trying. Review by LordX on 9/15/2015. What a big but challenging map ! I love it, thanks for your work ! Review by [ChE] Jason on 10/8/2015. Great detail. Even though it is a large map, it is still well balanced with many different scenarios and outcomes. Review by Den-Sel on 2/27/2018. I love great maps and this is beautiful. Great for teams but also challenging in FFA (with many players).